Nice follow-up to Rick Dangerous, this time more akin to old aliens-invade-the-Earth movies than to Indiana Jones, but gameplay retains the same addictive action/puzzle blend of the original. After the archaeological antics of Rick's first outing, he returns home to London.... only to find that entire city is being attacked by aliens. Determined to save the day once again, Rick soon climbs the stairs that lead into the bowels of the alien mothership. Although the levels are no more archeological digs, gameplay remains the same. 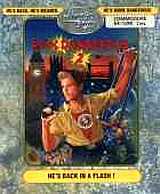 Rick starts the game equipped with a ray-gun (limited shots) and several electronic detonators (also limited), both of which can be used to triggering and neutralising traps as well as blasting aliens. While aliens are easily spotted and terminated, traps are what makes the game very devious and sets it apart from other platformers. Lasers built into the walls are hard to find and avoid. You must also pay attention to various switches and levers that are scattered throughout each level. These activate lifts, guns, and various other alien equipment that will help your quest. The game takes you across five levels, from the interior of a spaceship to the alien planet and beyond. Unlike the first game, you can now play the levels in any order - but you have to complete all of them to get to the fifth and last level. The cartoony graphics are outstanding throughout, although they are (of course) duller than the Amiga original. Luck is more important than judgment for many puzzles, where trial-and-error is the only way to figure out how to escape the scene. You will likely die many times (especially after level 2) from pushing the wrong thing at the wrong time. Despite frustrating deaths, though, you still want to keep playing, because it's chock-full of that "just one more try" quality that all classic games share. If you like the original and want more of the same, Rick Dangerous 2 won't disappoint, although be warned: it's not a little tougher than it's predecessor.